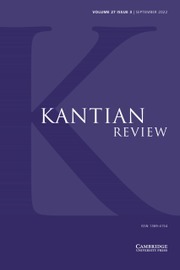 Kantian Review publishes articles and reviews selected for their quality and relevance to current philosophical debate in relation to Kant's work. In recent times Kant's philosophy has influenced contemporary philosophers over a wide range of issues from epistemology, metaphysics and philosophy of science to moral and political philosophy, philosophy of religion, aesthetics and teleology. Kantian Review invites contributions to these debates along with original accounts of Kant's texts, and of the development of his thought in its historical background. Publishing quarterly from 2017, the December issue is devoted to special topics. Do we Always Act on Maxims? Was Kant a ‘Kantian Constructivist’?